Hydration is necessary for everyone living anywhere with any skin type ! This Biotherm Gel cream is one of my favourite items that I must have on my shelf. The green line is for normal combination skin while the pink line is for normal to dry skin. 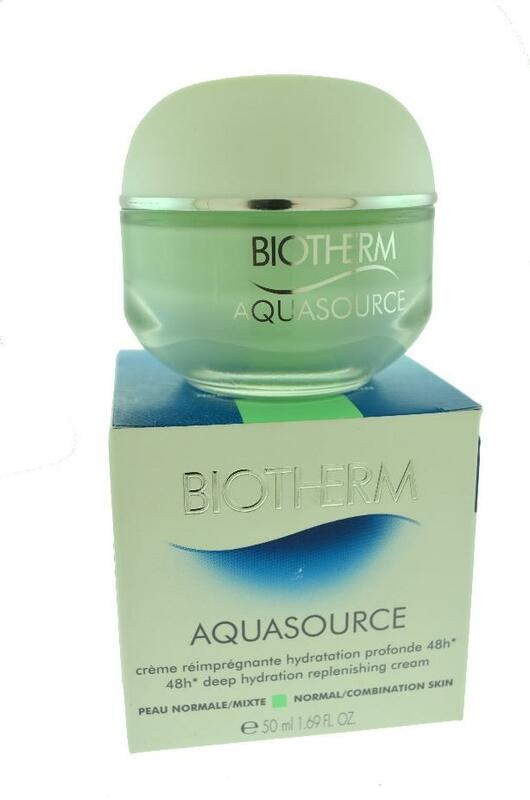 Biotherm claims that this product can keep you hydrated for 48 hrs and that it contains no preservatives. In the States, it was $36 in Nov 2013, then now it's $47 !! Maybe the price increased due to foreign exchange currency? There are a few ways how I like to use this product..
2) as a primer before I apply my make up -- having a layer of hydrated skincare helps your foundation stick onto your face much better!! 3) mix it with some foundation, the ratio should be 1 to 1, then apply it onto your skin, telling yourself that you are applying skincare and not foundation, this creates a natural and sheet look which sticks very well to your face. I took a bit of Biotherm Aquasource 48h Deep Hydration Replenishing Cream mixed with a bit of MAC Fixed Fluid SPF 15. The result is great!! It's very easy to spread and very hydrating. My make up is not too thick, not too thin, of course I followed with loose powder so my make up lasts longer. It smells refreshing, feels great and it is non-greasy too! !